Like a veritable phoenix from the ashes, Ingrid Eggers has recovered from being summarily dismissed by Rudolf de Baey, Director of the Goethe Institute, where she was let go as the programmer for the Institute's annual Berlin & Beyond Film Festival. Her unexpected dismissal sent shock waves through the Bay Area film community—much like the graceless dismissal of Anita Monga from the Castro Theatre some years back—and brought to the surface the abiding respect and affection festival audiences have for the keen spirit Eggers has contributed to San Francisco's festival landscape. Whereas Monga's dismissal inspired an entrenched boycott of the Castro Theatre for several months, Ingrid's situation reflects the inverse: the rallying cry has been to show up at the Castro Theatre this Sunday, February 28, 2010 to support German Gems, Ingrid's one-day six-hour celebration of German and Austrian cinema. Three of the films will screen at Point Arena on March 6, 2010. German Gems has added importance for filling the gap left by the capsized Berlin & Beyond film festival, which failed to run in its annual late January time slot. Word has it that one of Mr. de Baey's first decisions was to re-mount Berlin & Beyond in the fall, which immediately struck me as ill-advised since San Francisco's festival season is already at capacity at that time. One journalist friend emailed Mr. de Baey warning him that shifting the festival to the fall would be crazy, to which Mr. de Baey succinctly countered, "I am not crazy." Okay then, how does stubborn fit? Or better yet, arrogant? When it comes to Rudolf de Baey, little cattle little care. More pertinently, German Gems promises to be a new incarnation of Ingrid Eggers' insightful programming with five films screened back to back. The event has even received a vote of confidence from Berlinale Festival Director Dieter Kosslick, who has written: "Dear Film Friends in San Francisco, Good luck with your new film project. With Ingrid Eggers at the helm, German Gems is set to sparkle at the top of German cinema in America today." KALW's Kevin Robinson elicited a preview from Ingrid Eggers on his radio program Crosscurrents. They discuss two of the films on the German Gems slate—Vision, Margarethe von Trotta's acclaimed portrait of Hildegard von Bingen, and Tender Parasites by Austrian filmmaker Wolfgang Murnberger—as well as financing opportunities for filmmakers in Germany's current climate. On screener, I've watched two films from the German Gems line-up and look forward to catching the rest at Sunday's event. In Norbert Baumgarten's sophomore feature Being Mr. Kotschie (Mensch Kotschie, 2009) the skies are cerulean with promise, but the clouds in protagonist Jürgen Kotschie's coffee are ominously rumbling and roiling. Baumgarten has infused the male midlife crisis with droll melancholy and scored it with Baroque a capella music that adds a dash of whimsy to Jürgen's emotional quandary. 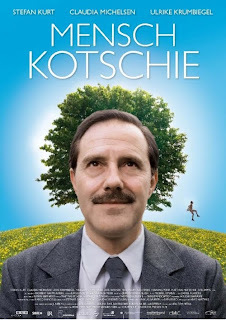 Though he seems to have everything a man could ask for: wife, home, family, success, money, and admiring colleagues, Jürgen Kotschie is having difficulty facing 50 and his self-confidence is as mutable as … well … the clouds in the sky. Plagued by insomnia, and with the constant reminder of his father's senility indicating what's to come now that his youth is behind him and his body is in decline, Jürgen's complacency unravels as he grows at odds with his hectoring wife, his selfish and unresponsive son, and the banality of his workday routine. He takes off on a last-chance adventure down the proverbial road not taken and encounters a freeloading dog, a free-spirited hitchhiker, a lost love, and a chance to bare his soul on a karaoke stage. That scene, incidentally, reveals actor Stefan Kurt at his best. It's painful to watch him awkwardly singing Del Shannon's "Runaway" even as he realizes his youth has already run away from him and there is nothing he can do about it. This admittedly familiar fable is rendered poignant by top-notch production values, including winningly-pitched ensemble comic performances, a colorful palette, surreal setpieces, and the aforementioned baroque choral score (the film won Best Production at Kinofest Lünen 2009). Baumgarten will be in attendance at both the film's Castro and Point Arena screenings. 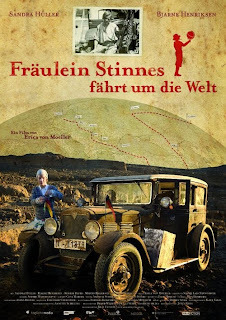 In the truth-is-stranger-than-fiction department comes Erica von Moeller's Miss Stinnes Travels the World (Fräulein Stinnes fährt um die Welt, 2009), a fictionalized documentary hybrid that recounts the globetrotting adventures of Clärenore Stinnes, the daughter of a wealthy industrialist who decided to circumnavigate the globe in an Adler. Accompanied by two mechanics and Swedish cameraman Carl-Axel Söderström (who worked with Greta Garbo before she abandoned Sweden for Hollywood), the team set out from Berlin in 1927, passing through the Balkans via Beirut, Damascus, Baghdad and Tehran to Moscow, where—abandoned by the two mechanics—Stinnes and Söderström carried on through Siberia, crossed the frozen Lake Baikal and the Gobi desert and arrived in Peking. 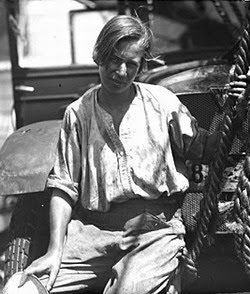 They traveled by ferry to Japan, later to Hawaii and South America, eventually to the United States, and back home to Berlin two years later after a journey of 47,000 km by car. As amazing as this accomplishment might be, the film suffers from the selfsame drudgery that characterizes the grueling effort to achieve such an accomplishment. The narrative is largely composed of incidents where the car gets stuck or breaks down and Stinnes cries about it. Söderström's original footage is interspersed throughout von Moeller's project and is, by far, its most redeeming attribute, along with some compelling graphics that chart the Adler's trajectory across the globe with intertitular historical context. Footage of Peking in 1927 is simply tremendous and greatly overpowers the film's anemic narrative construct, which is—unfortunately—poorly lensed. One wonders why von Moeller elected to mix genres instead of providing a straightforward documentary? 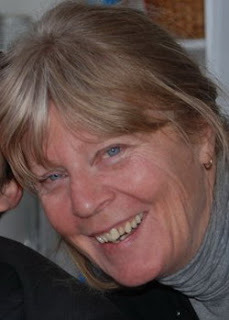 Granted, Clärenore Stinnes lacked considerable charisma on camera and it might have been necessary to cast an actress (Sandra Hüller) to portray her in order to convey some of her conflicted feelings for traveling partner Söderström. Though this device pushes the narrative forward, it does so ploddingly, much like Stinnes' Adler in Argentina's Cordillera. Perhaps von Moeller will explain her choices when she attends both the Castro and Point Arena screenings. heh heh, heh heh,... you said "fahrt"... heh heh! Seriously, I hope to see you Sunday!